power to regulate virtually all human activity and inactivity, the individual mandate is doomed. The conservative majority simply will not accept a doctrine that suggests that federal power is not one of limited and enumerated powers. Sure, I guess. But here’s what gets me. 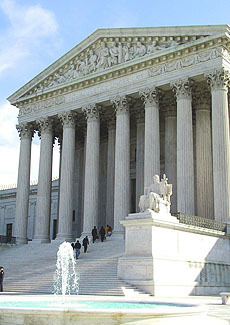 The previously most expansive ruling on the commerce clause came in 1942, in Wickard v. Filburn. In that case, the Supreme Court ruled that an Ohio farmer growing wheat for his own personal use was engaged in interstate commerce and was therefore subject to federal regulation. The court’s theory was pretty simple: if Filburn grew wheat above his authorized allotment, even if it was for his own personal use, that meant he would have to buy less wheat for other uses. And since wheat is traded across state lines, that meant interstate commerce was affected. Thus, even personal production of a commodity could be said to substantially affect interstate commerce. Now comes the individual mandate, and the argument against it is that the government isn’t regulating an economic activity, it’s regulating an inactivity. That is, it’s penalizing a decision not to buy health insurance. But if the government can penalize you for not doing something, then what can’t it do? So the argument is, roughly, this: it’s one thing for the government to regulate personal economic activity. That’s bad enough, but at least it’s activity. But regulating economic inactivity is a bridge too far. But what if the two cases had been swapped? Suppose the Supreme Court had approved the individual mandate in 1942 and Wickard were a 2010 case. Then the argument would be: it’s one thing to make people buy health insurance. That’s bad enough, but at least you’re regulating participation in a highly public and largely publicly funded sector of the economy. But regulating purely private activity is a bridge too far. In other words, it wouldn’t really matter. It’s not that the mandate goes further than Wickard, it’s just that the mandate is slightly different from Wickard. There’s no slippery slope, and the government doesn’t really have any powers that it didn’t have all along. If the commerce clause can forbid you from growing wheat because that will cause you not to buy wheat for other purposes, or if the commerce clause can force you to offer a room at your motel to African-Americans even though you don’t want to, then it can already force you to do things you might otherwise not want to do. I imagine Bernstein is right that the government’s lawyers will need to think up some plausible limiting principle, but it seems to me that the actual principle is already in place: does your activity or inactivity have a substantial effect on interstate commerce? In Wickard, in Heart of Atlanta, and now with the individual mandate, the answer is yes. You can invent a slippery slope if you want, but I don’t think it really exists anywhere except in the imagination.